OK, I've read a lot of posts here on the forums today on tires. 1. What Brand tire(s) do you have on your Wing? 2. How many miles on them? 3. Would you recommend them/buy them again? As previously stated in my "Resurrection" postings, I will be replacing the rubber on my old girl even though there is plenty of tread left on both the front and rear tires. I just don't know how much structural deterioration has taken place over the past 10 years sitting in my garage losing air ever so slowly. You can see a little bit about the Avon Venoms I put on my 1100 in this thread. I've got about 2,000 miles on them now, and I absolutely LOVE them. I've got tons of leeway for dealing with extra load, they are very sticky and great in the curves, and from what I have read pretty well everywhere, they wear evenly for a very long time. They are a little bit more expensive than most tires, but I will definitely be using them again! I put a pair of Shinko 230 Tourmasters on my project GL1100I after I had done quite a bit of shakedown running on the old set of tires, after getting the bike back on the road. The bike felt like it lost 100#, it handled so much better with the new Shinko's. 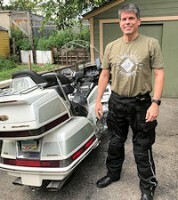 I have put over 1000 miles on them, including a super-slab trip up to WI, ridding 2-up with my wife. No bad manners to report, even on machined/grooved pavement or in a couple light showers we ran through. The load rating is higher than I could ever load my bike. The best part is they were $128.00 for the PAIR from Motorcycle Superstore, with free shipping! I paid a local tire shop $35.00 to mount them (I took them off the bike) and that included discarding the old tires and installing new stems. I balanced them myself before I put them back on the bike. I had found reports on the 'net of riders getting great mileage from the Shinko's. They look great too, IMO. I would buy another set in a heartbeat. I wound up purchasing Metzler's... I ordered the ME880 for the front and the ME88 for the rear. Both of these tires are rated excellently so I know I won't be disappointed with them. I will post back from time to time to report on how they handle and wear. I had already purchased them by the time Lake_Harley had posted about the Shinko tires, so I wasn't considering them in my research on replacement tires. I will include them next time I need tires. Motorcycle Superstore is great to do business with. I put over 11K miles on 2 rear Dunlop's and 18K on the front Dunlop on the '06 Kawasaki 900 I had. I ordered front/rear Dunlop's for my GW from Motorcycle Superstore because of previous good business with them.